We've just this week announced details of the third annual 'Tech Talent' event, and this year I'm very excited that I get to be a part of it! It's not just about promoting tech companies from the North East to the North East, but it's reaching far further afield. We hear so much about the skills gap especially within the tech industry here in the North East, but I think we could achieve a lot through better communication. As a region we need to communicate to the rest of the UK, and the world, what amazing businesses we have here! The innovation that's coming out of the region and the emerging technologies being developed are world class - and we should be shouting about them. Talented people, graduates and entrepreneurs don't need to head for the bright lights of London in order to have an impact on their industry! They can have an impact right here - plus get to enjoy the beaches and history and lower living costs and amazing restaurants and bars and festivals and culture and... I'll stop there but you get the picture! I'm not originally from the North East but I've chosen to make it my home, and I appreciate the massive diversity it has to offer - both in my personal time and in developing my own career. We can never shout too much about our successes as a region to the rest of the world, as well as showing off all the beautiful and amazing things we have on offer as a place to work and live. 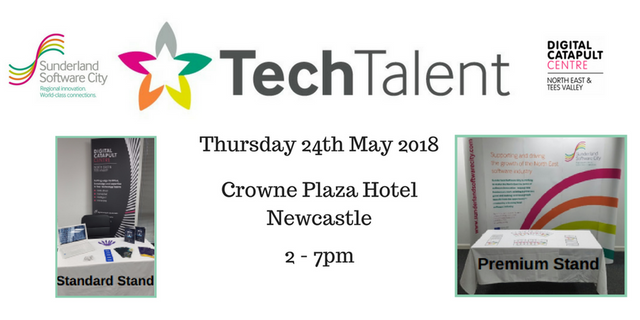 Tech Talent is about showcasing the best career opportunities the region's tech sector has to offer, and to attract talent (across technical and non-technical roles such as HR, Marketing etc) to the region. For more details on how to get involved, feel free todrop me a line.